The top 1 percent get a $51,000 tax cut next year. On Friday, President Trump signed into law a sweeping $1.5 trillion tax bill that’s deeply unpopular among Americans. Recent analyses by the Tax Policy Center and Joint Committee on Taxation agree: The Republican tax plan will undoubtedly fill the coffers of America’s wealthiest. In 2018, 80 percent of American households across all income levels are expected to get an average tax cut of about $2,100, according to an analysis by the Tax Policy Center. (Another 5 percent would get a tax increase.) But there are stark differences in how much taxpayers take in, depending on their income. Households earning less than $25,000, for instance, would get an average tax cut of $60, and middle-class households would get $900. Meanwhile, the top 1 percent of households would receive a cut of $51,000. Over time, that disparity gets even worse. At the end of 2025, most of the individual tax cuts expire while corporate tax cut provisions remain. 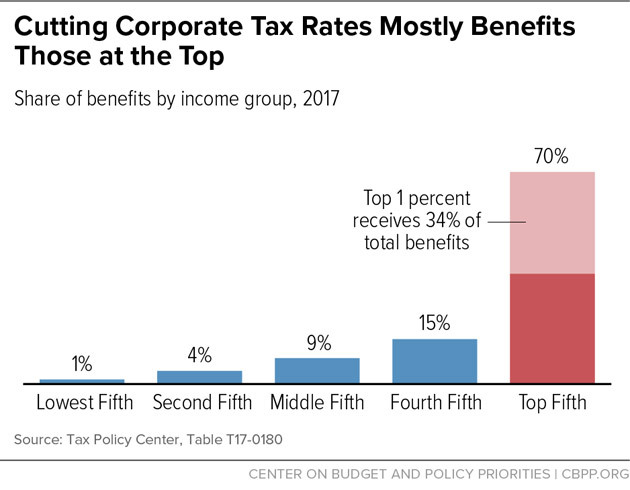 That year, the top 1 percent would still receive a larger share of tax benefits than the bottom 60 percent of Americans combined. In 2027, low-income households will see their taxes rise by $30 in 2027 as compared to what they’d pay under current law. The top 1 percent, on the other hand, would still get a tax cut of $20,660. 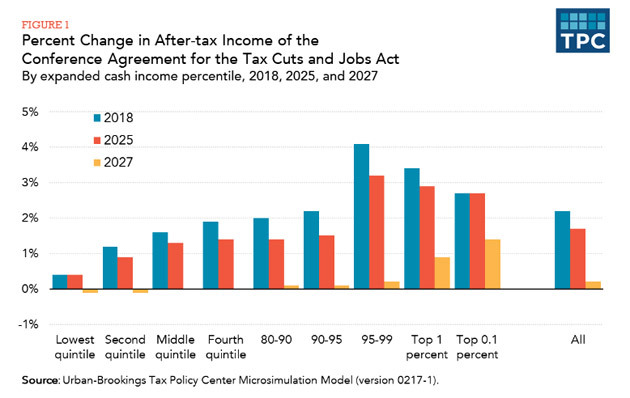 In 2027, the top 1 percent would receive 83 percent of total benefits, while 53 percent of taxpayers will see a tax hike. That year, people making less than $75,000 in income would see tax hikes, including a 26 percent tax average increase for those who make between $20,000 and $30,000. The final Republican tax plan includes a 20 percent deduction on so-called “pass-through” income, a win for business owners, particularly real estate developers. The complex provision would effectively lower the top tax rate from an already-reduced 37 percent to 29.6 percent, allowing certain businesses with substantial income to take advantage of the tax benefits. Howard Gleckman, a senior fellow at the Tax Policy Center, wrote in mid-December that under the Senate plan, which allowed pass-through business owners to deduct 23 percent of their income, business owners could receive an average tax cut that’s three times larger than workers who rely on wages for income. And tax scholars warn that the pass-through write off could incentivize workers to reclassify their income in order to exploit this new loophole. “This violates a basic rule of good tax policy: that taxpayers with similar situations should be treated similarly,” Gleckman wrote at the time. 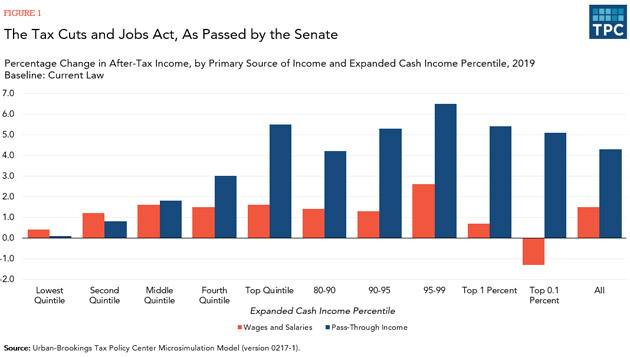 Most of the income that flows into pass-through businesses comes from upper-income households that make more than $200,000 per year, such as doctors, lawyers, and hedge fund partners, according to the Tax Policy Center. While the individual tax cuts expire at the end of 2025, the corporate tax cuts are permanent, providing a windfall of tax benefits to businesses for the foreseeable future. An analysis of an earlier Republican tax plan, which proposed cutting the corporate tax rate to 20 percent, down from 35 percent today, found that 34 percent of benefits would go to the top 1 percent of earners. The final Republican tax plan would slash the corporate tax rate to 21 percent. The Center on Budget and Policy Priorities pointed out that, at most, a quarter of the corporate tax cut benefits would reach workers. Even though Republicans didn’t kill the inheritance tax, they managed to double the threshold at which the tax kicks in, allowing ultra-wealthy Americans to pass on up to $22 million in assets to their heirs tax-free. Doubling the exemption means that just 1,800 estates could receive a tax cut of $4.4 million for each person in a married couple, according to the Center on Budget and Policy Priorities. 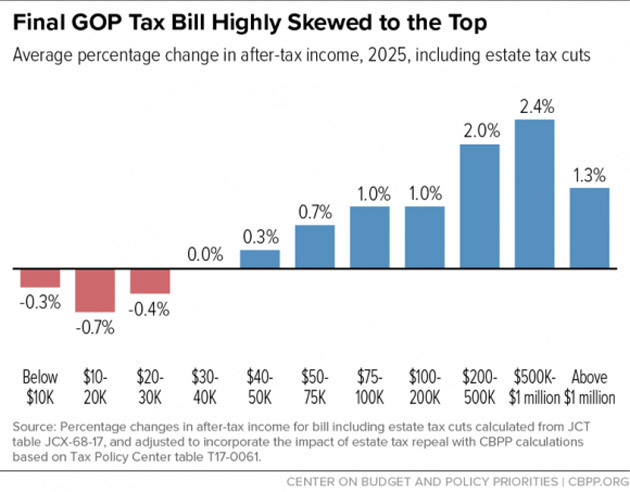 The think tank projected that, taking into account changes to the estate tax, households with more than $1 million in income could see a tax cut of more than $25,000 in 2025. Meanwhile, middle-class households would receive smaller tax cuts. This post has been updated to reflect that the bill has been officially signed into law.